A 3 page 100 grid activity that can be used in multiple ways. Ideal to use in the classroom when learning how to navigate and use a 100 grid. 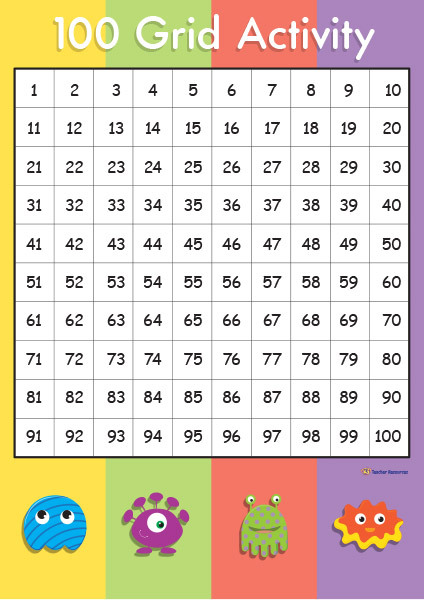 This resource includes a complete 100 grid, a 100 grid with missing numbers and a frame to cover and reveal 1 more than, 1 less than, 10 more than and 10 less than. Select and download the required font and colour option. A colour, black and white and low colour version has been provided. Laminate a class set of complete 100 grids. Cut out a small group set of Flip Frames. A craft knife would be preferable for this adult cutting task. Ask the children to become familiar with the complete 100 grid. Encourage them to find patterns in the column and rows. Ask the children to fill in the numbers on the complete the missing number 100 grid. Using the complete 100 grid, ask the children to position the Flip Frame over any number. Encourage the children to identify 1 more than, 1 less than, 10 more than and 10 less than the number in the middle window. Ask the student to check their answers by folding back the frame and revealing the numbers.